Tee Connectors There are 5 products. 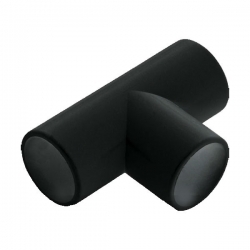 A 3/4" (21.5mm) solvent weld tee in PVC-U. No expansion gap required on the solvent weld overflow system. Apply solvent cement evenly to both surfaces of joint, insert pipe fully in the socket depth and remove surplus cement with a cloth. 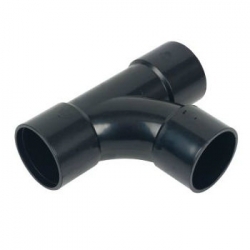 A 1.1/4" (32mm) solvent weld ABS waste pipe swept tee in black. A lightweight yet strong and cost-effective option. Apply solvent cement evenly to both surfaces of joint, insert pipe fully into the socket depth and remove surplus cement with a cloth. 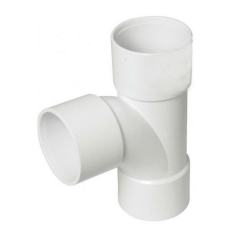 A 1.1/4" (32mm) solvent weld ABS waste pipe swept tee in white. A lightweight yet strong and cost-effective option. Apply solvent cement evenly to both surfaces of joint, insert pipe fully into the socket depth and remove surplus cement with a cloth. 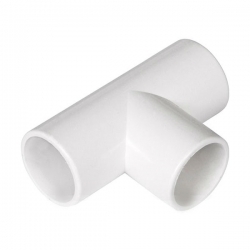 A 1.1/2" (40mm) solvent weld ABS waste pipe swept tee in white. A lightweight yet strong and cost-effective option. Apply solvent cement evenly to both surfaces of joint, insert pipe fully into the socket depth and remove surplus cement with a cloth.